Starbucks announced this morning that it will offer an incredibly generous tuition reimbursement plan for its partners (employees) who work an average of 20 or more hours per week in one of their more than 8,500 company operated stores. Starbucks partnered with Arizona State University (ASU), which offers more than 40 undergraduate degree programs online including electrical engineering, global logistics management, health sciences, information technology, nursing, operations management, organizational leadership, software engineering, criminal justice and criminology and technological entrepreneurship and management. Starbucks partners have no obligation to stay with Starbucks past graduation. For eligible partners who are admitted to ASU as a junior or senior, Starbucks will provide full tuition reimbursement to allow them to complete their degrees. Those admitted as freshman or sophomores will receive a partial tuition scholarship and need-based financial aid for two years of full time study. Starbucks has broken the mold before when it comes to how they treat their employees. Partners working an average of 20 or more hours per week receive access to a wide range of benefits that in most companies (and particularly, many retailers) would only be available to those working full time (40 hours). To add the tuition plan to the benefits package really changes the game when it comes to attracting and retaining quality people in general and veterans in particular. Many veterans who transition directly to college out of the military soon find out that the Post 9/11 GI Bill, while very generous, does not cover all of the non-study related expenses like housing, childcare and transportation. So, many student veterans find that they need at least a part time job while in school to cover those additional expenses. Starbucks’ tuition reimbursement program applies to employees who work an average of 20 hours a week, making this the perfect blend (pun intended) of hours committed to work and school. ASU is already considered to be a “military friendly” school in that it offers the Yellow Ribbon program, which covers the gap between in-state and out-of-state tuition, it has the Pat Tillman Veterans Center to support student veterans, and it offers the Tillman Military Scholars program which helps to cover other financial gaps experienced by student veterans (a non-traditional student body) such as housing and childcare expenses. There are lots of colleges that offer online degrees, but not all are as supportive of the needs of their student veteran population, so Starbucks selected a perfect partner in ASU. The Post 9/11 GI Bill benefit is transferrable to military spouses or children, so if the veteran is hired by Starbucks and, through the ASU tuition reimbursement program, does not need to use their entire GI Bill benefit, they can transfer the unused portion to the spouse or child. Double win for that military family! The Post 9/11 GI Bill benefit can be used for undergraduate or graduate programs. So, if the veteran hired by Starbucks completes their undergraduate degree through the ASU tuition reimbursement program, they will have benefit left over to use toward a graduate degree later. Since there are still too many employers that are less enthusiastic to hire veterans who do not have a bachelor’s degree, I wonder what those employers would be willing to do to fix that situation. 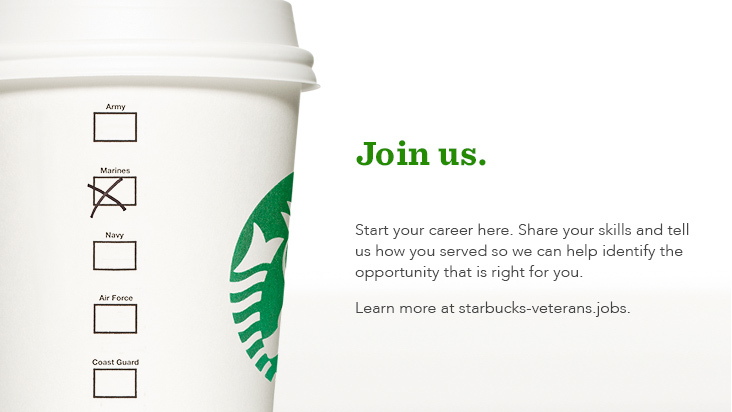 Starbucks’ program is not specifically for veterans, but because it exists it can significantly improve their ability to attract veterans and military spouses. Are other employers willing to offer scholarships, internships, work/study arrangements to support student veterans and military spouses? What do you think? What challenges and benefits do you see with this model (in general) and its potential for veteran recruiting specifically? Post your comments below! Eliminates requirement for employers to collect hiring information on each sub-category of protected veteran because, as you may be aware, some veterans qualify in more than one category. Thus, the new regulation would eliminate double counting and eliminate the possible, inadvertent identification of disabled veterans, etc. By the time the regulations become effective (one year after after effective date of new rule, so no earlier than mid-2015), employers would only need to collect information for the aggregated number of “protected veterans,” instead of the numbers in each sub-category. If your organization would like to submit comments for consideration on this NPR, they must be submitted by April 25, 2014. Instructions on how to submit comments are in the NPR. The OFCCP also published new FAQ’s for VEVRAA and FAQ’s for Section 503 on their website this week. Commitment to Veterans – Lip Service, Hype or True Investment? Recruiting veterans has become trendy. Particularly around Veterans Day, I watch as company after company has its CEO or Director of HR stand on the floor of the New York Stock Exchange, or on the Intrepid, or in front of the cameras of a major news network and state that the company has made a commitment to veterans and will hire some number (usually in the thousands, because that is the number it takes to get media attention) over the next 1-5 years. Press releases are sent, pictures are taken with the President and other politicians, and corporate communications spends 3-4 days fielding calls and inquiries from the media. There are a lot of companies that think all they need to do is make a public announcement about their commitment to veterans, and resumes of qualified candidates will start falling out of the sky and perfect matches will quickly be made. After all, we keep hearing the stats that there are more than 250,000 service members leaving the military each year and almost a million currently unemployed, so, seriously, how hard could this be? Results and statements like that are a red flag to veterans. The BS meter will start ringing, and, thanks to social media, the veterans will begin letting their extensive network of fellow veterans know just what they think of your “commitment”. Now, obviously, I am speaking to large companies in this blog. If you are an HR rep in a small company that only plans to hire 10 people this year and would like 1 of them to be a veteran, this is not aimed at you. But, if you are in recruiting for a large company that is going to hire hundreds or thousands of people in 2014, and you’d like some percentage (8%, for you government contractors out there who fall under the Office Of Federal Contracts Compliance Programs / OFCCP) of those hires to be veterans, then keep reading. Have we committed sufficient budget to this effort? Have we identified a program manager, and does she/he have decision-making power? Have we identified a team of recruiters who will focus on recruiting veterans? What is our plan for training recruiters and managers on military culture and skills, so that more opportunities become available to veterans? What changes or modifications do we need to make to our current recruitment processes to give a veteran’s resume a fighting chance of getting through the system? How much time, effort and budget is committed to outreach? As a point of comparison, examine what your company is spending for campus recruitment versus military recruitment. Large, Fortune 100 companies typically hire anywhere from 1,500 – 15,000 new college grads every year. The campus recruiting effort is typically led by a dedicated manager and that person may have 15-40 dedicated recruiters working to attract the best of the upcoming year’s graduating class. The manager has a dedicated budget for the campus recruiting effort. The other 5,800+ colleges will not receive specific materials from this company, but the company welcomes and will consider applications from all students. When you look at metrics like that, and then compare it to the effort your company is making to recruit veterans, how do the numbers stack up? Making that comparison would be a good place to start deciding how much of a budget to set for military recruiting. Chances are your campus recruiting program is more mature than your military recruiting program, so you should actually significantly increase the veteran recruiting budget and the number of recruiters for the first 3 years of the effort until you reach a level of program maturity. Unlike college recruiting, military recruiting can occur all year long, as people transition from the military every month. The Value Of a Veteran is hosting its 2nd annual Veteran Recruiting Conference in Dallas, TX Jan 21-23, and our theme this year is “Commitment to Veterans”. Most of our invited speakers are from companies that not only have made significant public commitments to hire veterans, but have “put their money where their mouth is” in terms of investing in changing processes and procedures to improve recruitment and retention of veteran. They have invested in training recruiters and hiring managers. They have put support systems in place to assist the veterans as they transition to civilian life. They have created internship programs for wounded warriors. And, many of the companies further invest in veterans through their corporate supplier diversity programs (buying from veteran-owned small businesses) and their corporate philanthropy divisions (donating to non-profits and schools that are providing direct services to veterans). And, best of all, they are willing to share their journey to robust and effective recruiting programs with the attendees. Since 2007 The Value Of a Veteran has offered comprehensive training on how to recruit and retain military veterans. In that time we have trained thousands of recruiters, hiring managers and supervisors from hundreds of Fortune 1000 companies, government agencies and higher education institutions. We have delighted in watching our clients utilize what they have been taught to significantly improve their ability to hire and retain those who have served our country. In the last few months we have received a few inquiries as to whether our training leads to the “Certified Veteran Recruiter” , Certified Military Recruiter” or “Certified Military Veteran Recruiter” designation. Perhaps organizations are firming up their training budgets and are trying to determine the difference between training products offered by The Value Of a Veteran and other companies. People have also asked us if we plan to offer any kind of certification in veteran recruiting in the near future, whether for individuals or organizations. The main difference between the two is that one focuses on completion of training and the other focuses on an independent assessment of your knowledge. So, no, The Value Of a Veteran does not offer the Certified Veteran Recruiter, Certified Military Recruiter or the Certified Military Veteran Recruiter program. All of the aforementioned programs are a packaged training course offered by only one vendor (none of which is The Value Of a Veteran). Despite the use of “Certified” in the name, none of those programs meet the standard of a professional certification program, and for someone to use the “CVR / CMR / CMVR” acronym as a professional credential after his/her name is misleading as it implies completion of a professional certification program. And, no, even though the idea of certification was first considered in 2011, The Value Of a Veteran has chosen not to pursue development and administration of a professional certification program for individuals. Clearly, there is a tremendous amount of work that goes into developing and administering a professional certification program, well beyond the development of the body of knowledge to be assessed. Our 6 years of experience in this space has also revealed one critical factor: when an HR professional (recruiter, diversity pro, etc) is in a job where he/she is responsible for military recruiting or retention, he/she is very interested in learning how to do this well. When he/she changes roles, moves on to a different focus area or moves out of recruiting/diversity altogether, the interest in continuing to learn about veteran recruitment drops precipitously, especially when the professional does not come from a military background. As a certifying body, it would be very difficult to maintain a continuous level of professional certification if those that earn a professional designation do not recertify or maintain continuing education. We have also refrained from creating any kind of “veteran ready” certification program for organizations. The ones that exist require little more than for someone from an organization to attend a training program (again, offered by only one vendor) and to then get their organization to make a commitment to hire a certain number of veterans, as few as 1 (! ), over the next year. We feel the liberal use of “certified” and “certification” to describe what are actually training programs dilutes the true meaning of the rigorous process of “certification”. A person or organization should have to do more than simply write a check and attend a class to be considered “certified”. So, while The Value Of a Veteran won’t certify you or your organization, we do provide excellent training programs. Our training courses are the only ones developed by someone with 22+ years of recent military experience and 16+ years of HR, recruiting, staffing, training and diversity program development experience, which is how we differentiate from other training providers. And, our training workshops, webinars and conferences meet the criteria for and are approved by HRCI for recertification credits for those that need the continuing education credits for PHR or SPHR certifications. If improving recruitment or retention of military veterans is on your agenda and you are seeking training for your organization’s recruiters, hiring managers or supervisors, please contact us to learn more about our training programs. I started receiving calls and emails within 24 hours of the Sep 15th Navy Yard shooting incident. Aaron Alexis, a Navy Reserve veteran with a sawed-off shotgun, went on a rampage on a secure military installation in a building with controlled access. The media wanted to know how someone with Alexis’ history of civil disturbances and inappropriate gun use could have received an Honorable discharge and what could his employer have done differently while conducting the background checks that led to his attaining a security clearance. The Society for Human Resource Management (SHRM) interviewed me and posted an article about types of discharges. I received many inquiries after the article was published from HR professionals who wanted a copy of paper I wrote on how to read and interpret a DD-214 (Transcript of Military Service). Almost every person who requested the paper indicated they wanted some way to ensure that they were not taking a risk by hiring a veteran. They felt that if they could have access to the veteran’s DD-214, they would find blemishes on his employment record, and then could use that info to screen out those who may be a risk. First, the DD-214 is essentially an employment record. Let’s imagine you are considering hiring John Smith, a non-military candidate who previously worked for Cisco, Dell and EDS. If you contacted those 3 employers to ask for John Smith’s employment record, you would be lucky to obtain much more than his dates of employment. Very few employers are willing to provide the employment record of a former employee, much less the reason that person no longer works for that company. If John Smith was chronically late to work, verbally abusive to his co-workers, and/or had two DUI arrests from his activities off-the-clock, his former employer might have used those as reasons for dismissal, but you, the gaining employer, would not have easy access to that info, unless any of those activities resulted in an arrest and/or a conviction or made the newspaper. Bottom line: You are taking a risk with any person you hire, no matter how unblemished they seem on paper. That a candidate happened to have served in the military indicates no greater risk. Second, that employment record (the DD-214) is not considered public information. You, as an employer, do not have a right to see the information. You can ask to see it as proof of military service, but you cannot obtain a copy of it without the written permission of the veteran. As I describe in detail in the paper, there are several versions of the DD-214, some of which contain more personal information than others. Copy-4 of the DD-214 has the most detail, including the characterization of service (i.e., the type of discharge received) and a code that reveals the reason for the discharge. That reason could be as simple as the fact that the service member reached the end of his contract. It could be as personal as a medical or financial reason. It could also reveal a person’s sexual orientation. The codes exist for internal use by the military. Certain discharge codes prevent a veteran from re-entering military service. Bottom line: You are opening up Pandora ’s Box by insisting on knowing the type of discharge and the reason for the discharge. You do not know the circumstances that led to the discharge type or the code. For you to pry into those circumstances could cause you to become aware of information that is personal and may have no bearing on suitability for a civilian job. For example, the person might have received an honorable discharge in 2008 with a code that indicates she was discharged for being gay. You now know something personal about that candidate that would otherwise be unlawful for you to have asked about directly. I know of a female veteran who was discharged with an “Other than Honorable” characterization for punching her supervisor in the face. What would be hard to deduce from a glance at a DD-214 was that the reason she punched him in the face is that, in that moment, he was trying to sexually assault her. Third, that discharge code reflects a moment in time in someone’s work history. 75% of the military is made up of enlisted members, and the majority of them join the service right out of high school. Young kids, 17-20 years old, away from home for the first time, have a knack for doing foolish things. In the military, some of those foolish things could get you kicked out with an Other Than Honorable Discharge. Does that mean that 6 years later, after maturity sets in and the former service member has completed college and got his life back on track, that his discharge type and reason should be used against him when he is pursuing civilian employment? The Washington Post recently ran a story about a woman who was originally discharged from the Navy in 2010 under “Other than Honorable” conditions. The characterization stemmed from a failed drug test, which was later determined to have resulted from proper usage of a prescribed medication. The military has rules on disclosing prescription drug use PRIOR to submitting to a urinalysis. She was eventually able to get the discharged upgraded to “Honorable” fifteen months later. What might have happened if she had been trying to find employment after the military and the DD-214 revealed an “Other than Honorable” discharge for drug use? Bottom line: the discharge type is designed for government use to determine the types of benefits (medical, education, housing, etc.) someone is entitled to after service. The Honorable Discharge makes a veteran eligible for all benefits, whereas the other types of discharges result in eligibility for few or none of the benefits. It can be a misleading document in the hands of someone who does not understand military service or who believes that they can mitigate employment risk by using it to eliminate from consideration those who have anything less than an Honorable discharge. If you insist on seeing copy 4 of the DD-214 (the copy that shows the type of discharge and the release code) you had better have a good reason for asking for it (e.g., you are hiring for a government contract and the contract requires any veterans hired to have an Honorable Discharge for purposes of getting a security clearance). Keep in mind – Aaron Alexis received an Honorable discharge and had a security clearance. The DD-214 is not a Rosetta Stone that reveals all you need to know about someone’s background in order to make a hiring decision. If the person you want to hire is the best candidate for the job and passes your standard background checks, then you have made the best decision you could have given the info to which you had access. Final Ruling on Veterans from OFCCP – Cha-cha-cha-changes are coming! The Department of Labor’s Office of Federal Contracts Compliance Programs (OFCCP) has been exceptionally busy these last few weeks. On July 31st it sent it’s final ruling on the amendment of the regulation governing contractor and subcontractor affirmative action and non-discrimination obligations toward veterans (otherwise known as Section 4212 of the Vietnam Era Veterans’ Readjustment Assistance Act / VEVRAA) to the Office of Management and Budget (OMB) for final review. Today (Aug 27) the OFCCP released an announcement that the final ruling has been made and will be issued via the Federal Register in a few days and will become effective 180 days after publication in the Federal Register. You can read the highlights of the final ruling here. Just a few days ago, the OFCCP posted to its website its updated Federal Contract Compliance Manual (FCCM), which provides internal guidance to the agency’s compliance officers on evaluating federal contractors’ adherence to their affirmative action and equal opportunity obligations and investigating discrimination complaints. This manual had not been updated in almost a decade, so now the almost 800 field agents will have a common set of standards to follow when conducting desk audits, complaint investigations and determining resolution for contractor non-compliance. So,what does this mean for compliance folks within the companies that are subject to OFCCP? It means you, too, can review the FCCM and see what the compliance officers can ask of you during the situations listed above and prepare for what you will be asked to do once the final rule on Section 4212 is issued. For example, in the Notice for Proposed Rulemaking, where OFCCP first proposed all the changes it wanted to make to Section 4212, it mentions creation of “linkage agreements” between the contractor and organizations for purposes of recruiting. The updated FCCM actually provides a sample linkage agreement letter. So, if you were not familiar with what a linkage letter is or what it looks like or how it will be used, the FCCM will give you a clue before the final rule is issued. I’d love to hear from some corporate compliance folks regarding the new FCCM and the final ruling on Section 4212 – what do you think? What have you found to be helpful now that you can see the updated FCCM? What concerns you? Please type your comments into the section below. An OFCCP Spring? The Much Anticipated Revision to Veteran’s Regulation Coming in April 2013? I hardly ever have time to blog twice in one week, but this one just can’t wait! Buried deep on page 106 of a 111 page Regulatory Agenda (thank God for CTL F), the Department of Labor has actually put a written mark on the wall as to when its Office of Federal Contracts Compliance Programs (OFCCP) plans to publish its much anticipated revision to the affirmative action provisions of the Vietnam Era Veteran’s Readjustment Assistance Act of 1974. The notice of proposed rulemaking can be found in a document entitled “Affirmative Action and Nondiscrimination Obligations of Contractors and Subcontractors Regarding Protected Veterans”. Federal contractors have been waiting and grinding their teeth since July of 2011 when the public comment period on the proposed changes ended. If you are new to recruiting veterans, you can get caught up as to what the proposed changes are by reading some earlier blogs posted here. Just click on the tag for “OFCCP”. The last 18 months or so have been no picnic for the OFCCP field agents who have been constantly harangued by contractors in public forums where veteran recruiting topics are discussed. I recently received an inquiry from someone who was newly charged to develop the military recruiting program for his company. He wanted to know how he could determine the number of veterans currently employed at his firm. He had participated in a company diversity meeting where there was much data on the number of female employees employed at the company and that information was used to discuss strategies for increasing the number of women hired and positioned as part of a diversified succession plan. Because there seemed to be so much data on the number of women employees, the writer assumed the company would have similar data for the number of veterans employed by the company. He was frustrated to learn that, after much delay and hemming and hawing, the diversity lead stated that the information was protected as it is considered personal information, and therefore it could not be released to him. Recall that, at this stage, he was just trying to establish a baseline number, not actually collect the names of veterans employed by the company. My response was that I suspect the reluctance to provide the information had more to do with the fact that his company had not been tracking veteran status well prior to this point. Plus, the diversity lead may not realize that the company keeps some records of military hires for purposes of compliance with the Office of Federal Contracts Compliance Programs (OFCCP). This is not a perfect method, as a hired veteran could qualify under more than one category and be counted in all the categories for which he/she qualifies (example: if a veteran is recently separated, has an AFSM AND is disabled, he/she could be counted 3 times. 2. If your company tracks (directly or through a 3rd party vendor) the number of Work Opportunity Tax Credits (WOTC) it has earned for hiring specific categories of veterans (those with disabilities, those unemployed for 6 weeks/6 months or those on food stamps), you may be able to get a report on the number of vets hired that meet those criteria. There may be some overlap with item #1 as one of the WOTC categories is veterans with disabilities. 3. If your company offers military leave or a pay differential for National Guard or Reserve members who have been called up to active duty, your HR department may be able to report the number of people who have used that military leave or pay differential in the last 10 years (or at least in the the last year). This will get you some data on Guard/Reserve employees, but presume the number is larger as not all will have been called to active duty since 9/11. 4. Lastly, if your company has a veteran employee resource group (ERG), the leader of that group may have some “home grown” data on the members of the group. What other techniques have you used to baseline the number of military members in your company? Please share your ideas in the comments below. What is the Definition of a “Veteran”? It would seem to be a fairly straight forward question: Are you a veteran? A civilian who has never served in the military likely defines veteran as someone who has served in the military. However, people who have served in the military see many more shades of gray in the answer. For purposes of collecting the Work Opportunity Tax Credit, a veteran is generally defined as someone who has been released from active duty. For purposes of maintaining compliance with the Office of Federal Contracts Compliance Programs (OFCCP), a veteran is defined as one who was discharged or released from active duty because of a service connected disability or one who has received an authorized campaign badge or Armed Forces Service Medal. If the applicant is in the final stages of transitioning from active military service (on ‘terminal leave” or other service-specific classification that indicates they are using up vacation time, etc. ), they may say “no” because, until the military paycheck stops, they are still on active duty even if they are no longer reporting to their military unit on a daily basis. They can be in that status for several weeks or months and will be actively job hunting, applying and interviewing, but not yet seeing themselves as a veteran because they have not yet received their DD-214 (Certificate of Release or Discharge from Active Duty). If the applicant is someone who is currently serving in the National Guard or Reserves, they may not reply “yes, I am a veteran” because they see themselves as still serving. To some National Guard and Reserve members, a veteran is someone who has completed their military service and has separated (completed their contract with the military) or retired. Other National Guard and Reserve members might say “yes” if they had been mobilized (called to active duty) at any time during their Guard/Reserve tenure, but those who have never been mobilized might say “no”. If the applicant is someone whose military service is from the 1970’s, 80’s or even 90’s, there are those who will say “no” because they have a belief that only those military members who have seen combat are the ones who can claim to be veterans. If they served for a few years and never deployed to a conflict, they may not perceive themselves to be a “veteran”. There are also those whose service may have been short (2 years) or from long ago (1970-1990) that they don’t see how or why an employer would view their military service as relevant to their current civilian employment or job hunt. Once a person self-identifies as having served in the military, then you can ask additional questions later (upon the offer of a job) that will further identify whether this person is considered a protected class of veteran (for OFCCP purposes) or eligible for the WOTC. Veterans: Don’t Just Hire Them – Do Business with Them! When I talk to companies about developing military recruitment and retention programs they are often surprised when I ask if veteran-owned small businesses (VOSB) and service-disabled veteran-owned small businesses (SDVOSB) are included in their supplier diversity programs. This can be a differentiator when it comes to marketing your company to prospective military applicants. I advise my clients to promote the fact that their company actively seeks to do business with VOSB’s as a way to attract veterans to their workforce. In recent years, the Census Bureau has begun collecting data on veteran-owned businesses. In 2007 veterans owned 2.4 million non-farm U.S. businesses and accounted for 9% of all non-farm businesses in the United States. 32.5% of VOSB’s operate in the professional, scientific, and technical services industries (NAICS 54) and the construction industry (NAICS 23). The bonus for companies that are focused primarily on minority and women-owned businesses is that many veterans also qualify under one or more of those demographic categories as well. The most common reason I hear as to why VOSB’s and SDVOSB’s are not part of the supplier diversity program is because employers don’t know how to verify that a business is, in fact, what it claims to be. Minority-owned businesses and women-owned businesses have certifying bodies (for instance, the WBENC for woman-owned businesses) that will audit the company and obtain verifiable proof that the company is majority owned by a woman or a minority. So, supplier diversity specialists know to look for those certifications. So, how can a company confirm veteran status or service-disabled veteran status? The most direct way is through the Center for Veterans Enterprise (CVE), a part of the Department of Veterans Affairs. The CVE certifies VOSBs and SDVOSBs. The veteran-owned companies listed within their database provide every type of product and service you can imagine, and have gone through the certification process in order to be able to do business with the Federal Government. However, just because they are focused on pursuing government work doesn’t mean they wouldn’t be happy to do business with your company as well. Another option is the US Business Leadership Network’s (USBLN) Disability Supplier Diversity ProgramSM, whichrecently developed a certification program for businesses owned by an individual with a disability, including service disabled veterans. The National Veteran Owned Business Association (NAVOBA) has a “Buy Veteran” website, which lets you search by keyword and location for a particular type of business. More than 47,000 VOSB’s are listed in that database. The annual National Veteran Small Business Conference and Expo. The 2012 conference will be held in Detroit, MI on June 26-29. More than 5,000 people attended/exhibited at the 2011 conference and 6,000 are expected for this year’s event. On average, about fifty-seven percent of exhibitors are SDVOSB’s and 16% are VOSB’s. The other 27% are made up of Federal government agencies and corporations. In addition to the big defense contracting firms you might expect to see exhibiting, corporations like Merck, UPS and Johnson and Johnson also set up booths. Really large corporations should also encourage their 1st tier suppliers to both hire military and contract with VOSB’s, much like the federal government does with its prime contractors. VOSB’s generally don’t have to be told to hire more military – oftentimes the majority of their employees are veterans. Supplier diversity professionals can utilize the knowledge of their company’s current veteran-employees to help them with this task. If your company has a veteran affinity/networking/resource group (ERG), tap them to assist with locating and vetting VOSB databases and expos. For more info on how to use your Veteran ERG’s I invite you to register for an upcoming live webinar entitled “Veteran ERGs: Deriving Real Business Value from a Veteran Employee Resource Group”. I am hosting live 90-minute sessions on Feb 6th and Feb 28th. The session will be recorded as a computer-based training module in the Spring and available for purchase 24/7 after that.